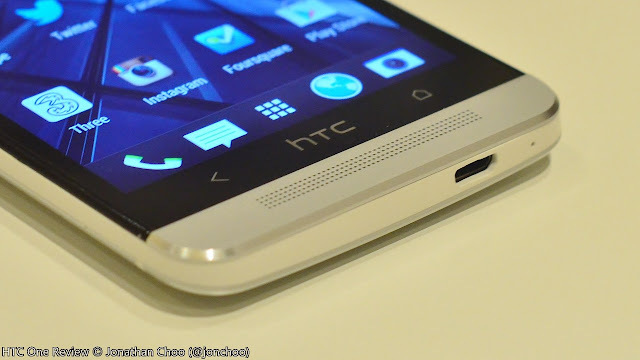 Last year's HTC One X was one of the best efforts put into by HTC. Announced alongside two other HTC One phones at MWC, HTC promised to reined in their portfolio, putting more emphasis into quality rather than quantity. Sadly that was proven not to be the case, as the One series was overshadowed by the release of a dozen of so phones throughout the year, diluting their portfolio and as a result, focus. For 2013, HTC appeared to have learned their lessons regarding the desire to over saturate the market with identikit phones. Announced just last week before MWC, the HTC One is a flagship deserving of its own spotlight and launch. Sporting a new design, the former HTC M7 looks the part of how a flagship should - it is luxurious, beautiful and premium, and it doesn't skim on the specifications. Not to say that the One X wasn't beautiful (it was), but it is nice to see HTC discarding their typical old habits of recycling old ideas. Special thanks to Three UK for loaning the device. You can pre-order the One from them now. Before we head into the review, let's get the specs out of the way, shall we? The biggest upgrade over the HTC One X and One X+ is the screen. The 1080p Super LCD3 display has a resolution of 1080 x 1920, offering a retina-busting pixel density of 468 pixels per inch (ppi), or mind boggling 1404 sub-pixels per inch. To be fair, the jump from 720p to 1080p isn't nearly as apparent as say from 480p to 720p, but there is a very slight difference. Still, from a technology point of view, this is incredible. It took many years before PDAs with 240x320 and 320x480 displays were displaced by 480p screens, but it took only a year for 720p to flourish before going fashionably out of date. Suffice to say, you will need very good eyes to notice the difference, and 720p is still more than enough for the majority of people. Even then, from a technology's perspective, 1080p over a panel measuring a mere 4.7" diagonally is amazing. HTC's choice of using a Super LCD 3 display should be applauded. I am glad to see more manufacturers finally shunning AMOLED technology in light of its power inefficiency when displaying websites, and over-saturated colours. The original HTC One X featured one of the best displays on the market (still is), and Super LCD 3 as its natural upgrade is just as good, if not better. Blacks is as good as it gets on a LCD display, with colour saturation high, but not too unnatural. Viewing angles are great, with contrast and colour only suffering a bit as you tilt the display. It is fortunate that we have been blessed with good weather lately, so I was able to give the HTC One's display a good testing outdoors. Despite the unusually bright and sunny spring weather, the One's screen was visible in all but direct sunshine. HTC's decision to go 4.7" instead of the industry's new trend of 5"+ is also a great relief as it makes using the phone one-handed just a bit more bearable. When it comes to design, the attention to detail by HTC engineers is unparalled, and it isn't surprising to find the same with the HTC One. The blend of anodized aluminium and polycarbonate gives the One a premium look and feel unlike most flagships I have held in the past couple of months - and that includes the Sony Xperia Z and Nokia Lumia 920. With a weight of 143g, the One isn't terribly light or heavy. It feels very solid and easily pass my 'squeeze the phone tightly' test. Like the HTC Windows Phone 8X, I suspect the One is glued together, possibly making it almost impossible to self service the battery or other parts on your own. In terms of build quality, the One is solid. The choice to marry anodized aluminium with polycarbonate is certainly an interesting one, with most manufacturers preferring one or the other. We've seen good results in the past, and HTC certainly has a pedigree for designing great looking phones. 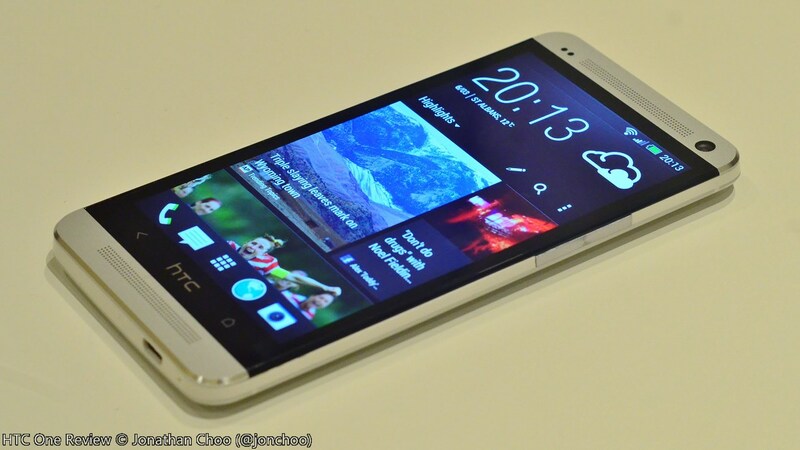 The HTC One really looks like what a good flagship should - it is original, well build and stunning. Where flagships by other manufacturer fails, the HTC One actually looks and feels like it is worth £500+. The same front facing camera used on the HTC 8X sits on the top of the display. The 2.1 megapixel camera has an ultra wide angle f/2.0 lens capable of capturing 88 degree angle - a useful feature for video calls between more than two people or self portraits among groups. On the bottom of the display are two Android buttons - the back and home button, with a button-less HTC logo sitting awkwardly between the two. Unfortunately the buttons doesn't appear to be sensitive enough. There is no menu button. The lack of menu button might proved troublesome, but I haven't encountered many issues with it. Most major apps has been updated to take this into account, but you will still encounter the occasional apps requiring the virtual space wasting menu button to pop up. Having said that, I still miss the menu button because I hate it whenever an app places the menu button on the top corner - not everyone has basketball thumbs. (Edit: you can also hold down the back button to simulate the menu button). 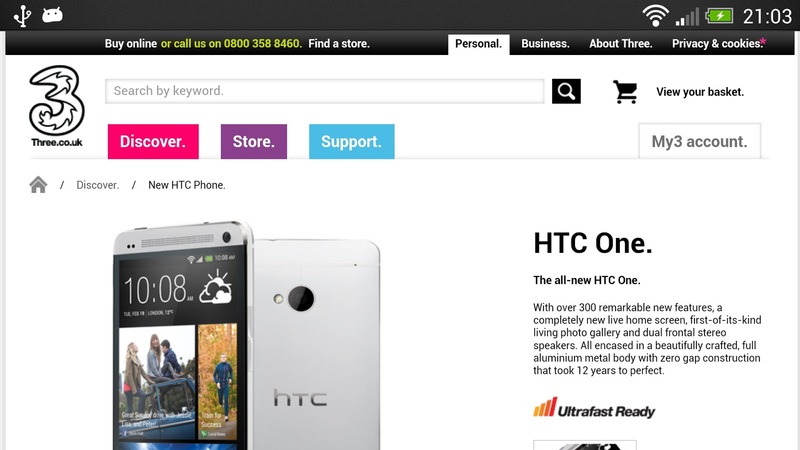 I also can't help that HTC got wrong about the location of the home button. It now sits on the bottom right side of the display, next to a none-working HTC logo (which I accidentally press tens of times a day). Sandwiched between the display and the back is the polycarbonate shell. HTC's decision not to go full out on aluminum is likely due to improve the phone's wireless signal. After all, plastic is better than metal when it comes to all things phone signal. On the top you will find the power key (again in an unergonomic location), which doubles as an IR blaster. I still I have no idea why anyone would want one. A 3.5mm headphone jack sits alongside it. Audio is powered by Beats Audio, but you ought to be clever enough to know that you should disable that music murdering EQ by now. HTC's design team has received some criticism in the past for recycling their old product designs for new phones, but it is nice to see HTC designers pushing out some interesting new designs. Like the HTC 8X, the One looks and feels fresh, as any flagships should. 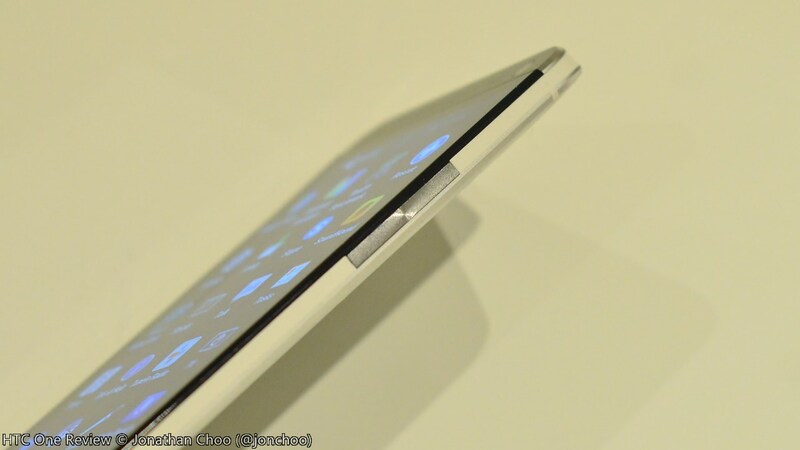 With a thickness of 9.3mm, the One thin or thick, and its weight of 143g is well balanced. And despite having a 4.7" display, it is only about a millimeter wider than the 8X, which is equipped with a mere 4.3" display. The One's hardware isn't without its issues. The backside of the phone is incredibly slippery, and if I were in the market for a One, I would seriously consider picking up a case for it. The location of the power button on smartphones has been a serious major point of contention, and HTC made the same mistake as they do with every phone, by placing the power button on the top. As Samsung, Nokia and Sony has all demonstrated, a side power button is far more useful and ergonomic for one-handed operations; and Apple can get away with a top power button because of the physical home button doubles up as an on button. HTC One is one of the first smartphone to run on Qualcomm's new Snapdragon 600 system-on-chip (SoC). The 600 features a quad core Krait 300 CPU clocked at 1.7 GHz and Adreno 320 GPU. On paper, it is identical to the previous Snapdragon S4 Pro, but with a faster memory interface, LPDDR3. The part number is APQ8064T, and is fabbed using 28nm technology. Unlike the more radical Snapdragon 800 due out later in the year, the Krait 300 here is designed to scale up to 1.9 GHz. For the One, the SoC is supplemented by 2GB RAM, which should be plenty enough for multi-tasking. The lack of microSD expansion slot will dissuade some buyers, but because the 4MP sensor rarely takes images barely larger than 1.5MB in size, you wouldn't run out of space quicker than say, iPhone 5 or One X users. All the usual gizmos associated with a 2013 flagship are present, including a built-in GPS and GLONASS receiver, Bluetooth 4.0, Wireless LAN 802.11 a/b/g/n, quad band DC-HSPA, LTE (where available), NFC, HDMI-out via micro USB MHL, accelerometer and gyroscope. 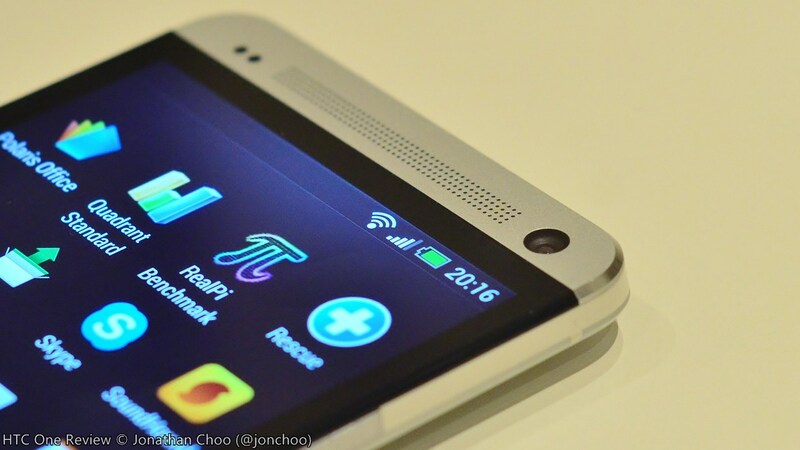 It does not appear that the HTC One is equipped with contactless charging. This is unfortunate as the HTC One's Japanese and American cousins, the HTC J Butterfly and Droid DNA, both feature wireless charging. While I would not exactly classify wireless charging as a killer feature, it would be nice to still have it. 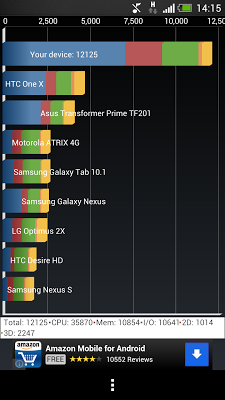 The Snapdragon 600 SoC used here is an upgrade over last year's Tegra 3. We have seen Qualcomm becoming a major ARM chipmaker last year with their Cortex A9-killing Krait processor. Thanks to the Krait, Qualcomm beat every other ARM chipmaker to market a next generation ARM CPU by a whole year. Some may question why HTC simply did not just wait for the Snapdragon 800, but you can't deny that the Snapdragon 600 is a worth SoC to be used in a flagship. The performance boost is huge when pitted against old school A9s, and even the S4 Pro. It is a very well proven SoC, and Krait is a great performer, with the new Krait 300 offering a slight upgrade over the vanilla Krait. 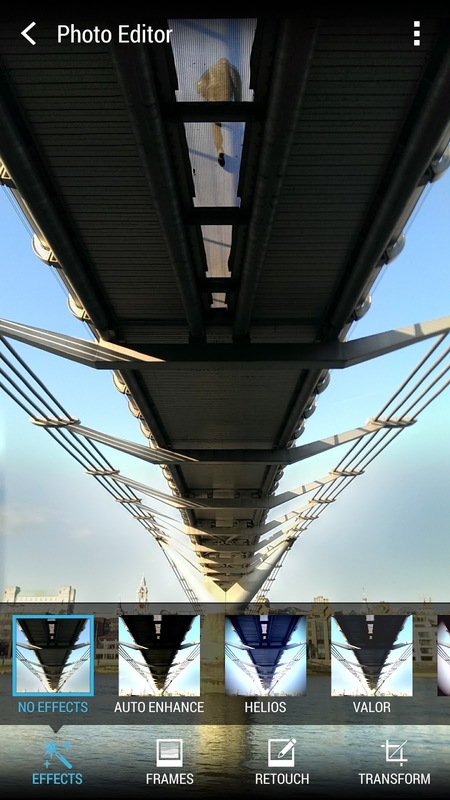 AnandTech has an excellent article pinpointing the improvements that Qualcomm has made to the Krait architecture, as well as their future road map. Enough specs talk, how well does it run? Well, it is fast, like really really fast. Unlike on previous Android devices, the lag here is minimal. When compared to HTC's previous flagship, the One X, the One is a huge upgrade, thanks to the vast performance increase afforded by the Krait CPU over the the Tegra 3. Where there is a second or so delay with the One X whenever you switch back to homescreen, the One is instantaneous. Is this the promised land of a lag-free Android smartphone? It appears to be. Synthetic benchmark apps confirm this: the HTC One's Qualcomm Snapdragon 600 is screaming fast, putting it almost on equal footing as the alleged Samsung Galaxy S4. 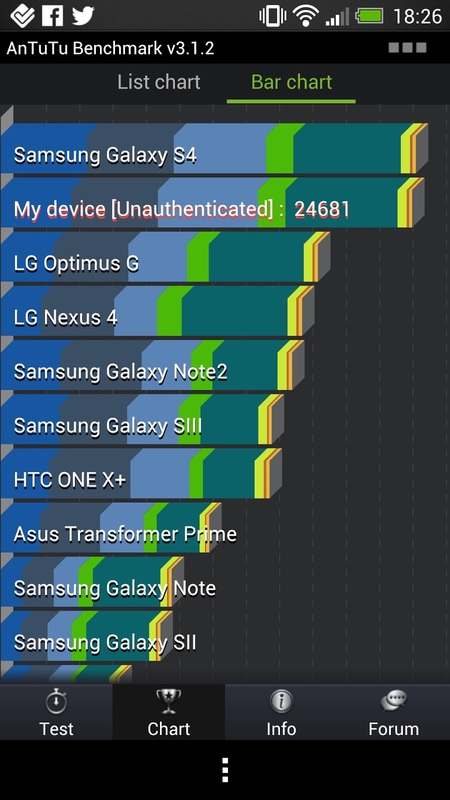 On AnTuTu, the HTC One scored 24681 on this pre-release firmware, a good 37% increase in performance over the four month old LG Nexus 4. 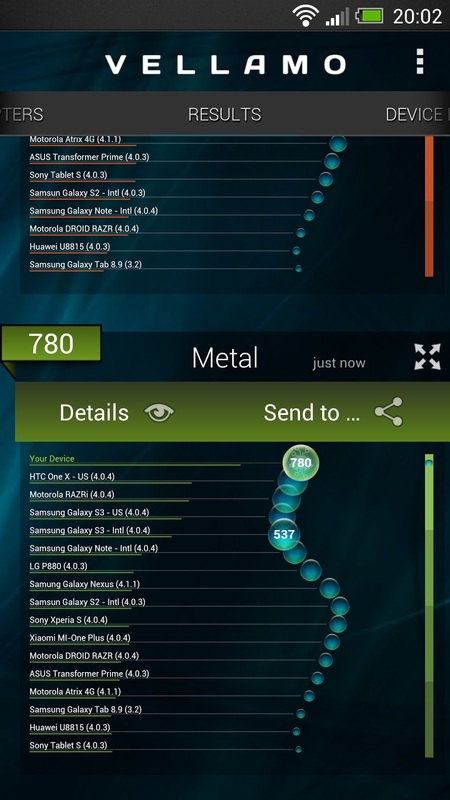 On Qualcomm's Vellamo 2.0 benchmark, it scored 2383 and 780 respectively on both the HTML5 and Metal test. Even if you are the type of person who tends to ignore synthetic benchmarks, the One feels speedy at all times. From launching apps to processing sweep panorama pictures, it doesn't break a sweat. Coupled with Android Jelly Bean, the One flies. Until devices with next generation Snapdragon 800 SoC and ARM Cortex A15 CPUs come onto the market, the One is one of the fastest smartphone you can currently purchase. 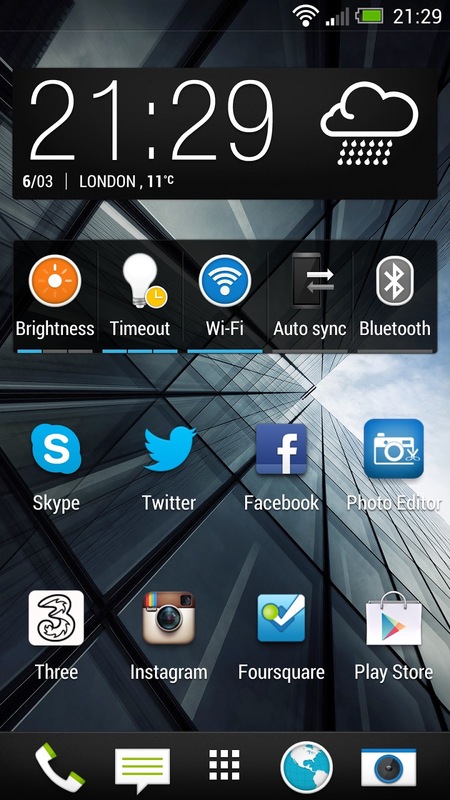 The new Sense 5 UI is a mixture of old Sense, old Android and Windows Phone's modern design. It will take some getting used to, not because it isn't intuitive, but because it feels and looks oddly out of place. In fact, the only time you will see the Holo theme is likely in a third party app. Sense 5 is also inconsistent, displaying a black background on the app drawer, but switching to white in other parts. It can be a jarring experience. I am also not a fan of the use of gradient effect used on the homescreen and other various UI elements. HTC's newest social home screen has been a cause of controversy, courting polarising opinions from all corners. 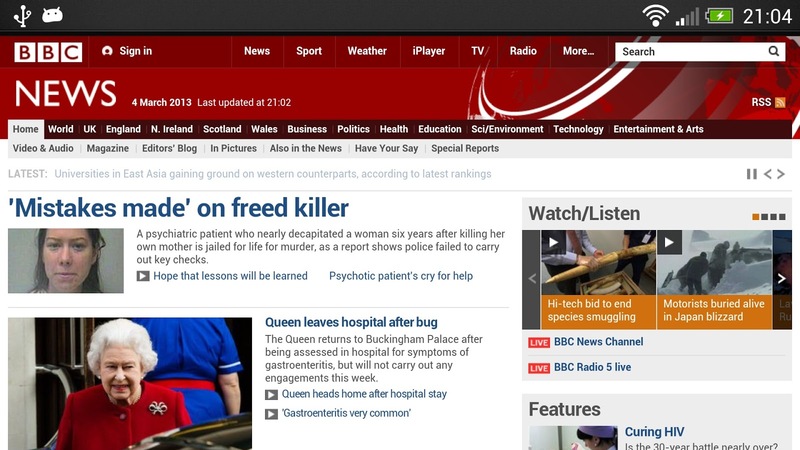 BlinkFeed (seriously, who gets paid to think up of this ridiculous names?) 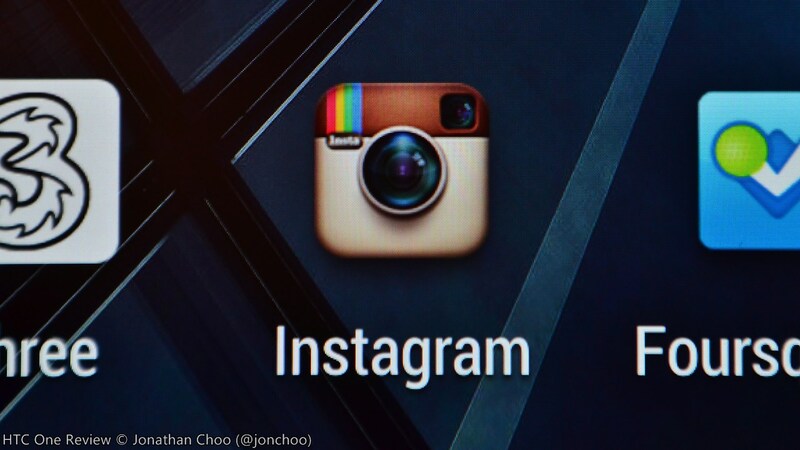 is where you go to, or at least what HTC hopes, for your social contents. The client hooks into the Facebook, Twitter live feeds, news and even your own gallery, and curates them automatically before streaming onto the homescreen. 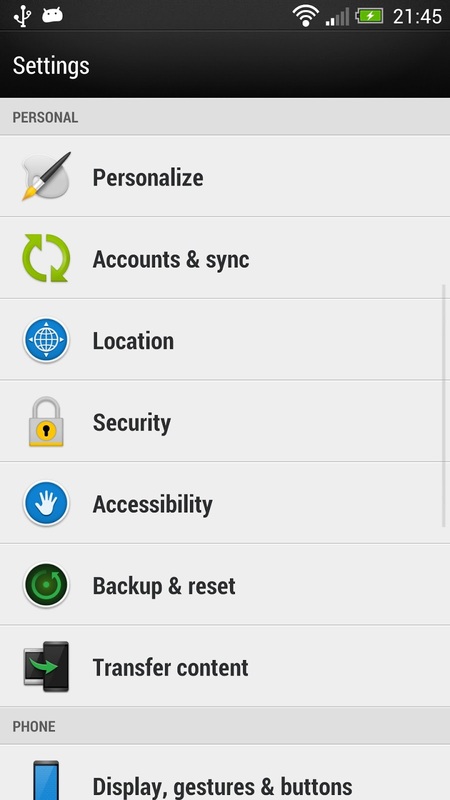 While you can change the default home screen, you can't disable it. It's basically one full size widget that can't be removed or moved. 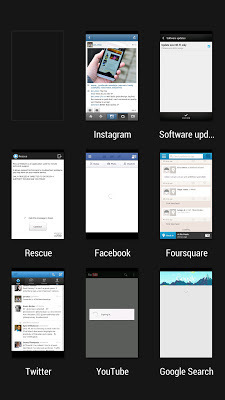 The app drawer has also been redesigned with grid size options of 3x4 and 4x5. 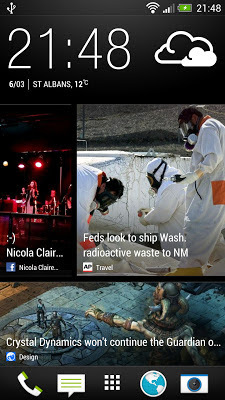 The same BlinkFeed weather widget and is now a permanent fixture of the app drawer whenever you access it. Folders are also supported within the app drawer. Like the weather widget, the five icon bottom dock is 'always on', only going away when you enter an app. 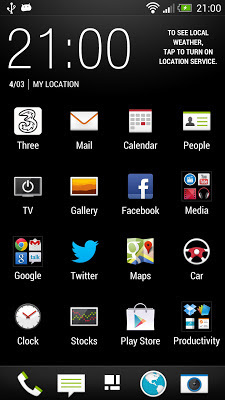 The typical UI introduced with ICS is no where to be seen. 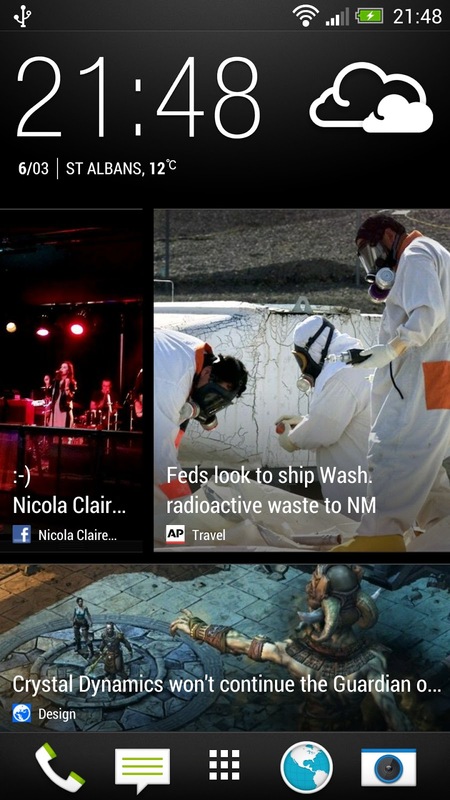 Fans of Android's Holo UI will no doubt be disappointed by its lack of presence on the HTC One. 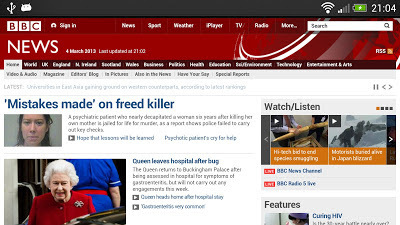 As expected from a display that features 1920x1080 pixels when viewed horizontally, the HTC One is a fabulous web browser. As long as your eyes can cope, there isn't even a need to zoom - it is that sharp. 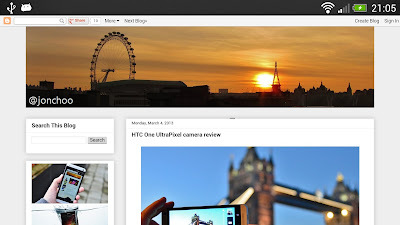 The latest version of Chrome is now stable, fast and accurate enough to dispatch the regular Android browser. Chrome supports a variety of features including Flash, auto-fill, disabling of JavaSript, multiple tabs, auto-paging, pop up blocking and GIF animation. Due to the lack of a multi-tasking button, double tapping the home button will bring up the multi-tasking page, displaying up to last nine apps assessed. You can dismiss apps by swiping them away, ala WebOS. Personally, I feel that this is one of the very few improvements HTC made over the stock Jelly Bean. It may look simple, but it allows you to easily have an immediate overview of the last nine app running on your device. 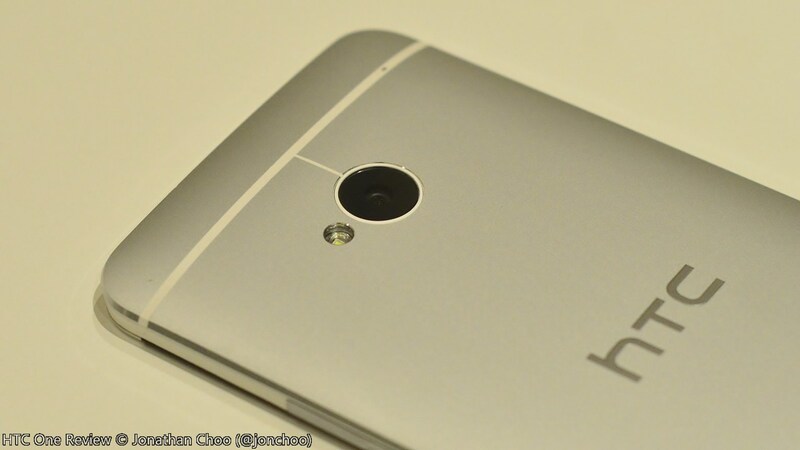 With the HTC One, HTC introduced a new 4MP imaging sensor they dub the UltraPixel. By effectively reducing the number of megapixel to half, HTC almost doubled the surface area in which its sensor's pixels can capture light. The One's imaging sensor features a large (for smartphone) pixel pitch of 2µm. HTC's previous flagship, the One X's camera sensors have a pixel pitch of 1.3µm. What this means is the sensor here is capable of capturing more light than those found in your usual slim and thin smartphone. The camera sits flushed within the back of the One's body. I've written an extensive review of the One's camera, and came away impressed by its speed and low light performances. 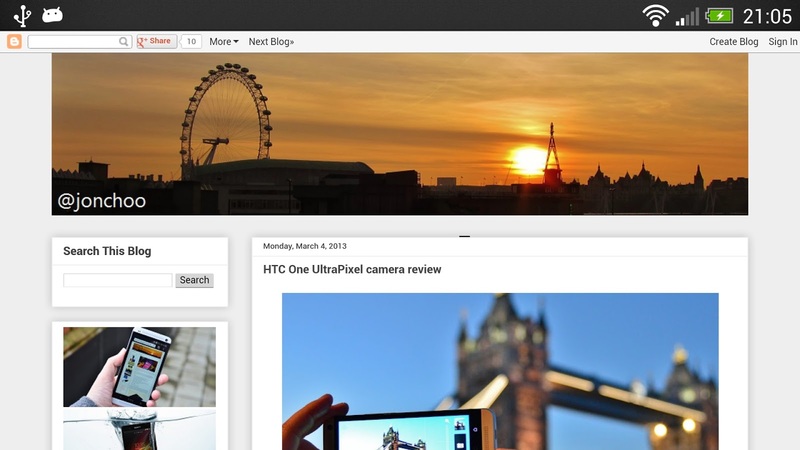 The HTC One comes with a new social network called Zoe Share. This proprietary service allows users to upload a selection of pictures, Zoes (short high quality clips) and even highlights of your photography day. It isn't the most intuitive service to use - for example, there isn't an actual Zoe app on the One so once you upload your Zoe, there is no actual way to delete or modify them. In fact, at the time of writing this review, the Zoe Share website does not allow HTCSense members to log in. Perhaps all of these will go live on 14 March, or maybe not, but HTC has to tackle this usability or rather, the lack of, issue right now. 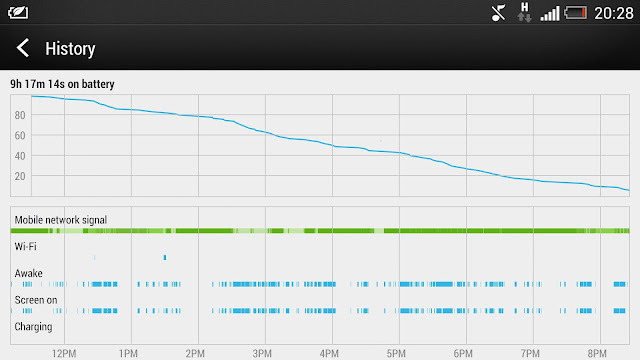 After a couple of days of heavy use, my concern with the modest 2300mAh battery has proven to be unfounded. The HTC One is a battery champ. It isn't a RAZR MAXX, but it is close. Despite the larger and higher resolution display; and quad core processor, the HTC One easily last through a normal work day. During my first full day with the One, the battery lasted nine hours before I had to fish out my portable charger. This might not sound like a lot, but I took about 300 pictures and 30 minutes of HD videos on the day, in addition to using Twitter and Facebook occasionally, and Foursquare and Instagram frequently, as well as having the GPS turned on and the brightness set to automatic. 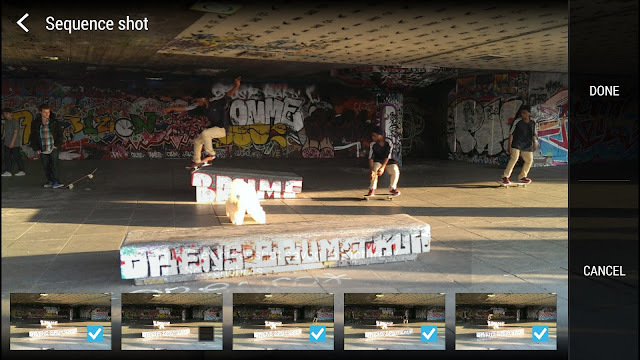 This was in London, where the congested 3G networks will give your phone a right hammering. On my second day, the One's camera was given a further work out by capturing a staggering 700 images, under almost the same circumstances as day one, except this time I enabled the Power Saver mode half way through the day. It also lasted nine hours. My Canon S90 itself isn't capable of lasting after 200 shots, so for the One to go much further is impressive. Remember, this was under my usual battery 'torture' test i.e. shooting as many pictures and videos as I possibly can until the battery is killed. Once I got into my regular usage pattern, the HTC One easily lasts through a whole day, from removing it from my wall charger at 7.30am until I get home at 7pm. My final 'torture' test consisted of streaming BBC News none-stop via 3G on maximum brightness with the volume set to around 30%. The One lasted around four hours before the phone complained - which is impressive considering its all streamed via 3G, which power consumption is far higher than Wifi. Standby time is even more impressive, with the phone's battery dropping by 5% after seven hours away from the power socket. 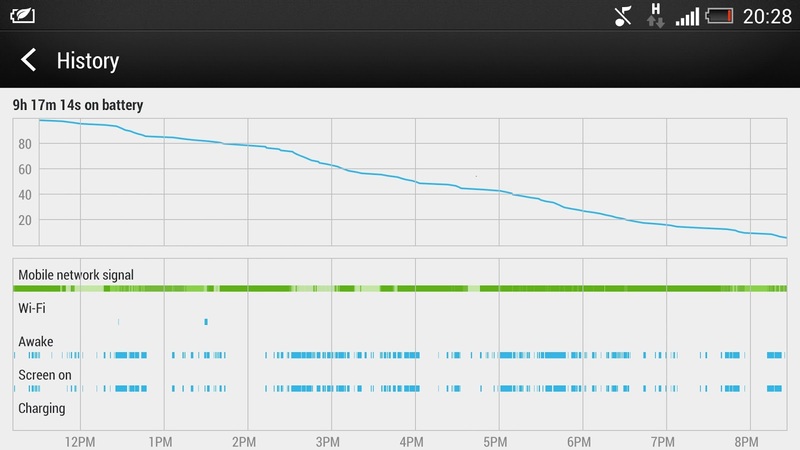 I have seen phones that lose that much after barely an hour of inactivity (glares at WP8's poor network management). Of the past ten or so smartphones I have reviewed, only two had replaceable batteries, so it appears that user replaceable batteries is heading towards extinction. Now, I like my batteries to be user replaceable, but HTC did a hell of a good job optimising the device considering the circumstances. Still, I do still wish for this trend by manufacturers to seal batteries into devices to revers, for those rare times when you do need that extra juice, and for easier maintenance. In terms of phone call quality, the HTC One held its own. Voice call is clear, thanks to the noice cancellation microphone which works well in suppressing background noise. HTC has described this technology, alongside its use of stereo speakers, as the BoomSound (urgh). Speaking of which, the front stereo speakers were loud. Like really loud. The clarity isn't top notch, but it doesn't crackle like other phones do when you pump up the volume to death defying loudness. Even if I am not a big fan of loudspeakers in general, I can appreciate a louder speaker. With the ultra wide angle front facing camera and BoomSound, it is easier to include more people into your video calls. For £519 sim-free, the One ain't cheap, but what you get is a genuine premium device. Previous flagships always fail to justify themselves as worthy upgrades, but not the One. Almost everything about the One is cutting edge, from the design to its build quality, its fast processor and gorgeous 1080p display. Even the One's UltraPixel camera did not disappoint, and was a joy to use at all times. With the alleged Samsung Galaxy IV due to be announced next week, and Sony finally kicking up a gear, HTC desperately needs the One to succeed. After all, unlike their conglomerate rivals, they do not have the luxury of other businesses to prop them up. From a technical point of view, the One is pretty much capable of propping up HTC. All they need to do now is market it properly. The One deserves this. Disclaimer: This review is based on a HTC One running on a pre-release firmware (version 1.26.401.6). I have been told so, after the publication of this review. The new firmware that is due to be released with the retail HTC One will feature some enhancement, among them tweaks to the camera. I will update this review accordingly when the new firmware is released. Great review Jon! Worth upgrading from the One X? Had you noticed that you can set the Back button to function as a Menu button on a long press? That surely eliminates most of your Menu button concerns? 2. Ah yes, someone told me about it, but I forgot to edit the review to reflect that. I would still prefer a proper menu button - not a fan of long presses. Can't you install another launcher to get rid of blink feed completely? Although from the screen shots I think sense5 is beautiful. I enjoyed your unbiased review Jon (unlike those reviews attacking One for lack of that 0.3 inch!). I was planning to buy the One and the camera and battery were so important to me. I so liked your photos in various light conditions in addition to good news about the battery! Thanks for the review, is much appreciated. I was wondering if the lens is sitting flush with the back of the phone or if is a little bit recessed. 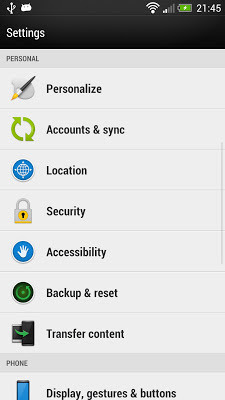 Can you tell me if Sense still has the 'Skins' feature in the 'Personalize' menu. I can see this option is still there in settings. Re: Launcher, yes you can. But this review is about the phone as is. @Faroscin: Thanks, yes the lens is sitting flushed with the back of the phone. Makes a good change to the One X. @David: Thanks, I've just sent the One back to HTC to get it reflashed, but if I've my memories right, it is for personalizing the Blinkfeed and selecting widgets for the homescreen. This might change in the release firmware. Enjoyed the review, quick question. The placement of the home button, is it really as annoying as I feel it might be (especially for a right hander) I can imagine it leading to more dropped phones because the grip of your hand will change to accomodate it... also anyway to set the volume button to become a wake on button, i hate the power button on top and fully agree with what you are saying there. Chris, thanks. There isn't any option to remap the power button. I am sure a mod will turn up one day but right now, that awkward power button is the only way to wake the screen up. Hi jon thanks alot for the review, im planning to get the one x+ cuz the one will be too expensive for me. Great in-depth review Jon. Thanks for taking the trouble to go into so much detail, much appreciated. I hope to read your review of a Samsung Galaxy S4 soon after its release on March 14. @Ahmed The One's screen is amazing, but to be honest, I had no problem switching back to 720p even after using the One. . The biggest upgrade appears to be the viewing angle. The One's viewing angle is exceptional. So yes, the One's screen is better than the One X, but then again, the One X(+)'s display is still pretty darn good. Both are great under sunlight. Thanks, fingers crossed on the S4! Great stuff here, thanks for the review. May I ask about flash player? Can we go around it somehow? I feel it is important and the only thing standing in the way now..
Why would someone want the IR blaster? For me, it's because I travel and sometimes the hotels only have basic remotes, which won't allow me to switch to the HDMI input so I can watch Netflix. If I can program the phone to swap inputs then that will be a big selling point for me. Also, I haven't read a review that covers the most important issue for me. . . reception. I'm still using an original EVO 4G as the Evo 4G LTE and S3 both had weaker reception compared to the Evo 4g. Were you able to test the reception at all? @Anon1 : Thanks for the kind words. Flash can be enabled in the browser, so there. Re: reception. It's tricky thing to test tbh, as I just don't trust the signal bars on phones to be accurate. Nor do I have the necessary equipment or know-how to accurately test it. Having said that, based on my experience, reception has been excellent even in built-up area of London (the bigger issue I was facing was how congested the networks were in London, rather than the reception itself). My bedroom is usually a fort, when it comes to allowing 2100Mhz 3G signal, but easily get 4 bars on the One, despite usually only getting about 2-3 bars on the iPhone. I can't compare with the Evo, as I believe that is a US-only smartphone. Jon, this is what I call a review - no bias, and a lot more thorough than professional tech blogs. Your pictures are great as well, so I trust your camera review more than reviewers who simply test it in lab or point the camera out of their window. May I ask if any dents has appeared on your One? This is my concern as the One looks a lot like the iPhone 5. Thanks! No dents on the body or scratches on the screen after a week of heavy use. But I would get a case regardless - the alloy back is slippery. Thanks for the extensive review! You just convinced me to get a HTC One. This is a none-biased and extensively tested unlike those 'hands-on review' you read everywhere. Can't wait to get my One next week now! do you think the xperia z or HTC one is better? 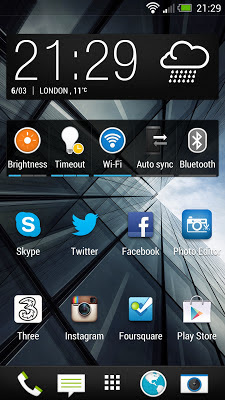 The main concern I have with HTC one is its user interface. will you be doing a galaxy s4 review later on as well? The Xperia Z is a neat phone, but I like the HTC One just a bit more. Having said that, the Z has some cool features like its burst mode and water resistant, so it really depends on whether you would like those features. Is it true that the display of the HTC One is visibly clearer and better in terms of the colours compared to the z? 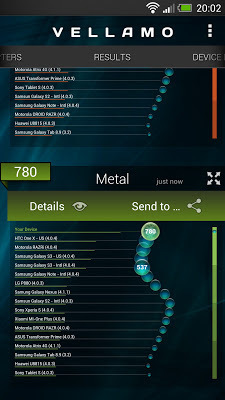 How user friendly is The One's UI compared to Xperia z? Could you also comment on the battery life of both phones please. thanks. sorry forgot to ask, Is there any way of playing MPG and avi files on the xperia z? I tried installing Moboplayer with all the separate add ons but it does not work. Can HTC one play MPG and avi? and how good is the IR remote control ability? is it very responsible and works for all TVs? 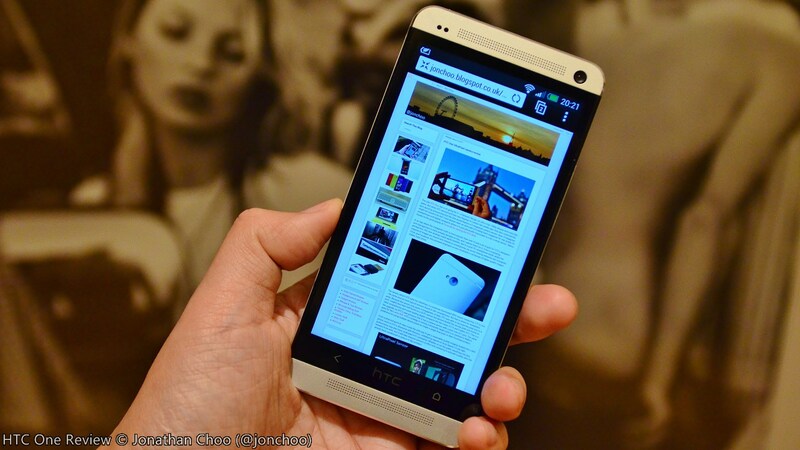 In terms of display quality, the contrast ratio and viewing angles, the HTC One beats the Z. The Z's UI is closer to Google's stock UI than the One's. Can't comment on the Z's battery life as I haven't had one to review. 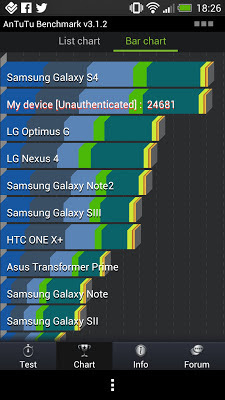 I've played AVI files on the One with no problem, but I never had issues with past Android devices in this case. The remote control works perfectly on my old Toshiba TV.